Lift: select .551" .570" .583" .585" .585" HP103 .585" MR103 .625" .635" .640"
Regardless of displacement or compression ratio with a stock starter, Easy Start Cams from S&S® Cycle make hard starting obsolete for 1999-16 big twins. Available in chain drive and gear drive versions. Don't get caught "dead" without them! More Proven Performance® from S&S Cycle, Inc., the leader in V-Twin high performance parts since 1958. Save your starter and battery! Reliable – tested for 10,000 starts and didn't even run the battery down! Cams that exceed the limits of the stock valve springs require the use of special high lift springs. Most S&S cams have higher lift than stock and are designed to take advantage of the extra flow of ported stock heads or S&S Super Stock® heads. Due to the high lift of these cams, S&S adjustable pushrods are recommended. Not all grinds are available in the chain drive version. To get the best performance from a performance cam installation, a high flow intake and exhaust system is also recommended. 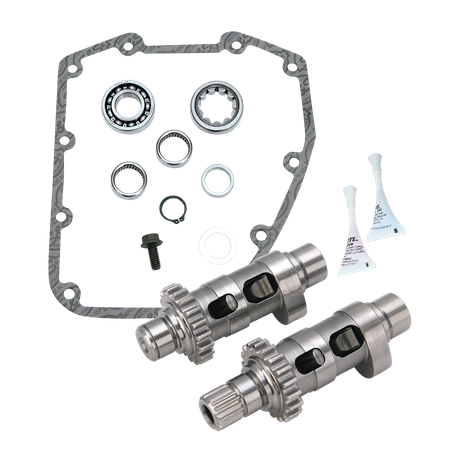 Quick installation and Easy Start® Cams allow stock starter to start any engine. Kit contains cams, gearcover gasket, cam bearings, and instructions. seat of your pants power! Installed these cams in my 05 softail along with an S&S 97" big bore kit, the torque increase in amazing! pulls hard in every gear all through out the RPM's! NOT LEGAL FOR SALE OR USE IN CALIFORNIA ON ANY POLLUTION CONTROLLED MOTOR VEHICLE. NOT LEGAL FOR SALE OR USE ON ANY EPA POLLUTION CONTROLLED MOTOR VEHICLE. ©2019 S&S Cycle. All Rights Reserved.